In David Koren I met a veritable hero. No, he is not the kind of hero that Hollywood or Nollywood rushes to immortalise. Yet, he’s the truest, grittiest kind of hero—by the measure of the difference he made, the depth of his humanity. Yet, he came across as unassuming, the kind of man quick to deflect attention away from himself. One of the fortunes of my frequent travels is that I meet fascinating people at different locations, even when I have no inkling of the possibility of such encounters. In stops in such cities as Los Angeles, Abuja, San Francisco, Johannesburg, London, Washington, DC, Houston and Austin, Texas, I have met classmates from my elementary, secondary school and college days, childhood playmates, former students of mine, elders who knew my parents before they were married, those who knew me as a snotty nosed, impish child, and folks with whom I had communicated for years, by email or telephony. Last week, I put out a notice on Facebook and Twitter that I was spending a month in Pittsburgh, PA to give several workshops and lectures, as well as present my memoir, Never Look an American in the Eye: Flying Turtles, Colonial Ghosts, and the Making of a Nigerian American. I received a note from Ndaeyo Uko, once one of Nigeria’s wittiest and most popular columnists, who is now an academic in Australia. Ndaeyo, who was a star writer at The Guardian and Daily Times, now holds a PhD. 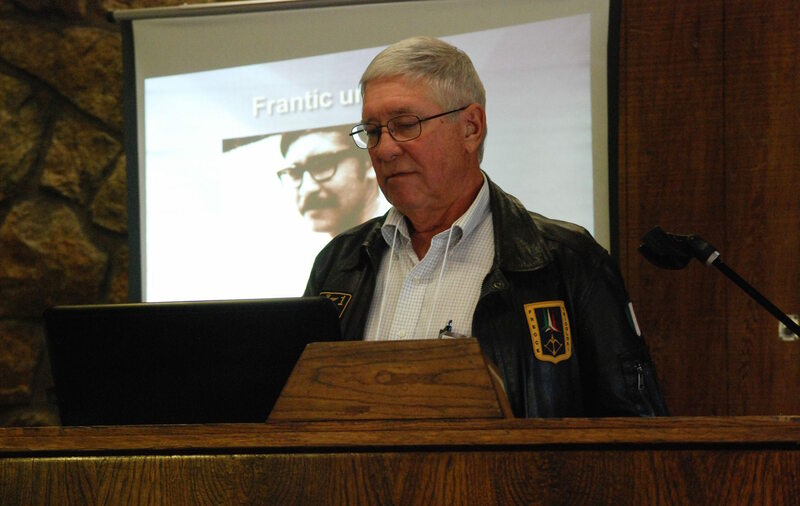 For his dissertation, he researched the daredevil motley of adventurers and philanthropists who discounted unimaginable risks to ferry food and, in some cases, arms, into Biafra during Nigeria’s ruinous thirty-month civil war. Ndaeyo’s message was simple: I was not to miss the opportunity, before leaving Pittsburgh, of meeting David Koren, an American who was part of that team of expatriates—Americans, the British, and Europeans—who, at grave risks to life and limb, undertook the perilous missions to fly-smuggle relief into Biafra. He explained that he had flown from Australia to Pittsburgh to interview Mr. Koren—and had found his recollections memorable. Last Saturday, Mr. Koren (accompanied by his wife, Kay) and I met at a bookstore run by the City of Asylum, the organisation that arranged for my monthlong fellowship in Pittsburgh. It was an emotional experience, for both of us. The airlifts were done at night, as the operation required the cover of darkness, to elude Nigerian MiGs commissioned to shut down the secret relief missions. Mr. Koren described how the flights landed at the Uli airstrip with little or no light. Sometimes, Nigerian jets, hovering about the strip, would commence bombing as the relief planes taxied. First, Mr. Koren gave me a copy of his book titled Far Away in the Sky: A Memoir of the Biafran Airlift. On the cover of the book is a photo of a youthful David Koren standing in front of one of the DC-7s that airlifted food into beleaguered Biafra. In the photo, the bespectacled youngster holds a gigantic spanner, sports a pair of boots and an unbuttoned shirt over a pair of pants. His wide smile, head slightly cocked, belies the grimness of the atmosphere. In fact, something about the photo evokes a certain sense of uneasiness. There is a palpable incongruity between the beaming young man, scholastic in bearing, despite the odd fact that his body and clothes are smudged with grease, and the exposed propellers of the aircraft, looking all gray, cranky and mindless. It’s the portrait of a young man as a stubborn idealist, unwilling to give up, seized by an endless faith in the human capacity to confront and transcend any, every, challenge. For me, that haunting photo and the story—the stories—it tells are worth the price of the book. Mr. Koren signed the book to me with the Igbo inscription, “Uwa di egwu” (roughly translated, “The world is full of marvels”). That statement could have been a caption for the cover photo. Mr. Koren’s first encounter with Nigeria was as a Peace Corps volunteer in Nigeria from 1964 to December 1966. His primary assignment was to teach English and science to students at Ohuhu Community Grammar School near Umuahia in present-day Abia State. Soon after his return to the US, Nigeria—unable to manage the task of welding itself into a coherent geopolitical community—finally ventured over a precipice. It descended into a war that claimed more than two million lives, most of the victims Biafran children and women who perished from starvation. David Koren could have cocooned himself in the United States and gone on living a relatively hassle-free life. But he was attentive to the tragedy in progress in Nigeria. He learnt that Biafra was blockaded, which meant that the young men and women he taught at Ohuhu were in harm’s way. He couldn’t shake off that dire prospect. When UNICEF made a call, he and five other Peace Corps volunteers enlisted to help unload planes that made clandestine trips from Sao Tome into Biafra, laden with tons of food. 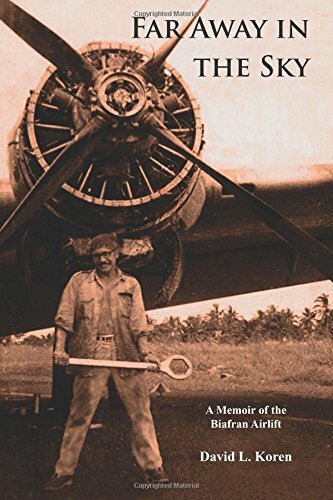 Even though he had no training, he said, he helped mechanics to repair the airplanes that ran shuttles, many of them in rather dismal shape. The airlifts were done at night, as the operation required the cover of darkness, to elude Nigerian MiGs commissioned to shut down the secret relief missions. Mr. Koren described how the flights landed at the Uli airstrip with little or no light. Sometimes, Nigerian jets, hovering about the strip, would commence bombing as the relief planes taxied. Given the precarious nature of the operations, it was no surprise that some of the airlift planes crashed, claiming the lives of numerous young men who, far from being thrill seekers, were idealists in the noblest tradition: wishing, above all, to be their brother’s keeper. I am grateful he has written a book, an account of what he and others did when life was awful and dreary for people like me and men and women of courage were needed to do whatever it took, often at steep personal cost, to keep the final disaster at bay. I explained to Mr. Koren and his wife that I was one of the millions of Biafran children who lived in the shadow of that horrendous war. Like others, I trembled before the cold, implacable clutches of hunger. And my waking and sleeping hours were haunted, what with the prospect—in other words, the reality—of Nigerian Air Force jets swooping down at all hours, shitting bombs all around us with deadly, diarrheic rage. I was one of the tormented children of Biafra, but also one of the lucky ones. I survived where many died. I told David Koren that his uncommon sacrifice and stupendous courage saved many, many lives, mine included. I was also luckier than many fellow survivors. I was never afflicted with kwashiorkor, that terrible aftermath of severe malnutrition that wreaked havoc on the physiques of victims. You knew a kwashiorkor child from their bloated stomach, discoloured, listless, sunken eyes, big, bony heads, wrinkled skin, and limbs so emaciated they resembled desiccated tree limbs. I am grateful he has written a book, an account of what he and others did when life was awful and dreary for people like me and men and women of courage were needed to do whatever it took, often at steep personal cost, to keep the final disaster at bay. As I began to read his book, I realised how deeply in his debt I was. Image credit: David L. Koren Facebook page.